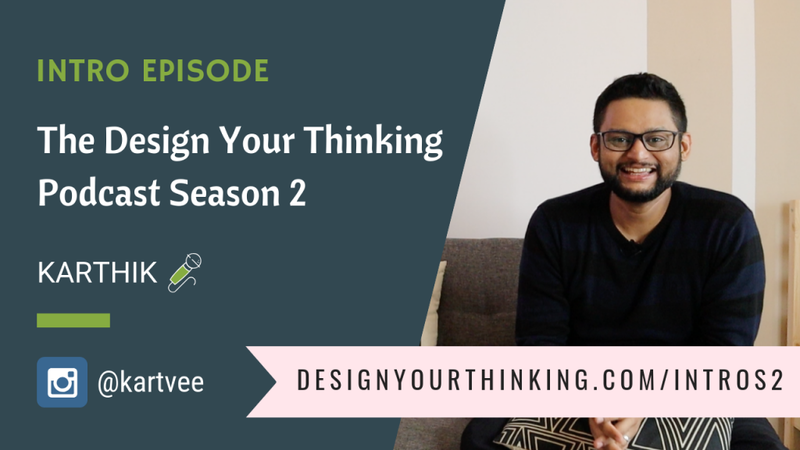 Welcome to Design Your Thinking Podcast Season 2! In this first episode, I introduce you to Season 2, WHY I’m doing this, WHAT you’ll get to hear and WHERE you can find the episodes in the interwebs! First things first – who’s hosting this series. That’s not changing – I’m your host Karthik and I cannot be more excited to be doing this! For those of you who’ve been listening to Season 1, I’m sure you notice that this season, Season 2, is different. Why? What is Season 2 all about? What kind of episodes will you listen to? That’s exactly what I want to do in this first episode of Season 2. Before getting into all of that, I introduce you to the new intro jingle! I hope you’ll like it! And since this series will have sponsor spots, I also introduce you to the subtleties to what you will listen when I talk about a sponsor during the show. Season 2 of the Design Your Thinking Podcast based on a manifesto I published early this year. And I wrote that manifesto around one simple idea. In the world we live in today, people are busy chasing money, careers and fame. While on the other hand things are breaking – marriages are falling apart, parents are getting to see their kids only on weekends, and unhappiness and discontent is on the rise. We are living in a highly distracted world. In the Attention Economy we live in today, attention has become the scarcest resource. You only have so much of it. You scatter it, and you’ll be left with nothing at all. And we pay so much of attention to everything and everyone seeking it, that we lose attention on ourselves. And by paying attention to careers, vacations, promotions, social media and such all the time, we lose precious moments of our life – including ourselves and what truly makes us happy. How will your world look if you took time to focus on your interests, connect with people around your interests and learn something new every day. When I looked around, I started to see quiet a few people doing this right. They’ve not just followed their heart to be happy, but also have managed to create a life and career around what makes them tick. So that’s what drives Season 2. In Season 2 of the Design Your Thinking Podcast, I sit down with creators, entrepreneurs and non-conformists from around the world who, through their life and work, inspire you to follow your heart. Season 2 is lined up with some really amazing conversations that are not just inspirational, but are designed to help you learn and stay motivated. You’ll find interviews with people from around the world who’ve followed their heart and interests. While all these interviews are audio interviews, you’ll find quiet a few of them in video too. When will you hear new episodes? Mark these days every week – Monday, Wednesday and Sunday. Every Monday, you’ll listen to a new audio episode. The videos come out on Wednesdays for DYT Insiders (that’s my email list). So if you want to be the first one to see the videos, do jump onto my email list (look to the right side of this page!). Videos will later get published on my YouTube channel on Sundays. That’s about it! I really look forward to being inside your ears every Monday! And yes, can you do me one favor? I’d like to give a quick shout out to Thrive Themes. Thrive Architect by Thrive Themes is what I use to build this website. Do try Thrive Membership if you’d like to build a website like mine with zero technical help. I’m happy to share all the templates I’ve created, should you choose to give Thrive Membership a try. You can head over to designyourthinking.com/thrive. Do signup for Thrive Membership and drop me a note at hello at designyourthinking dot com to get access to the templates. You also get my detailed guide to create the most important pages on your website along with the templates. Please share this episode with your friends and family! I really appreciate you doing this and hope to work hard to get you some of the best people and some outstanding conversations and insights.